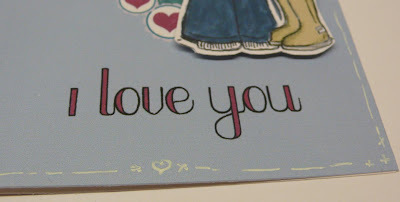 Card Making - Surely Not Me! I don't have any excuse for not blogging over the last two weeks only that I just didn't feel like it! But I have made a couple of little things and for the first time ever made a digi page that I much prefer to my paper page! 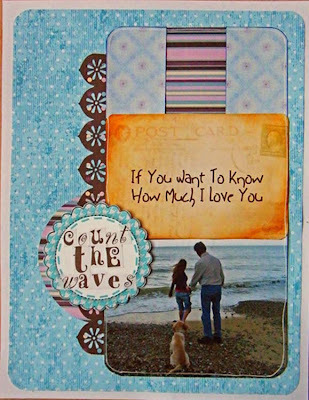 Help - I am beginning to fully embrace the love of digi scrapping. I am in the process of changing computers (a long and tedious job as I am having to transfer everything from the old to the new) and have decided to purge my photos at the same time. I found this, long forgotten, photo and remembered the quote so it seemed that fate was telling me to scrap - I always listen to fate. I first used a template from 2Peas and scrapped it digitally and loved the result. I then, as always, decided to make it in paper, using papers that were as close as the digi ones asI had in my stash. Although, I liked the paper version I much preferred the digi one! Am I becoming a proper digi scrapper and fully embracing the digi side of my personality? 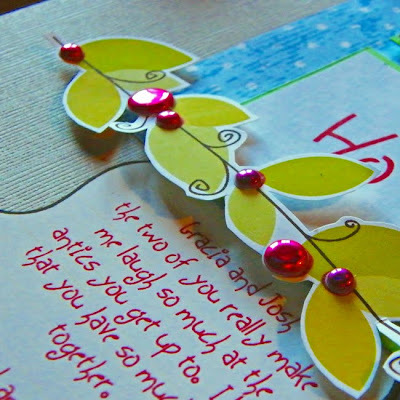 This afternoon I made a couple of cards - I do not profess to being a card maker as I make so few - maybe only 3 or 4 a year, other than Christmas ones. I felt the need to make something so decided to make a couple of hybrid cards. 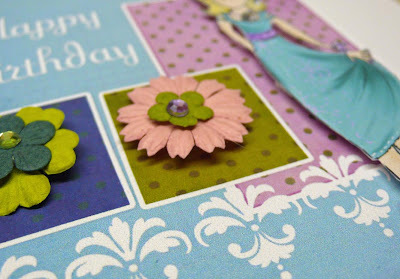 For the birthday card I used a digi template and scaled it down to A5 size then used digi papers. I downloaded an illustration from the wonderfully talented SJ (go over and look at her blog - she is so clever, I might even invest in one of her gorgeous illustrations as an anniversary present for David). 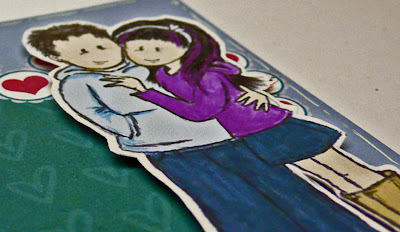 The Valentine's day card for David was made using Can't Buy Me Love kit from 2Peas and another cute illustration from SJ. 1. I am typing this on my now laptop as I watch Mo on tv. I love Julie Walters, a brilliant and sensitive actress. 2. I had spent 2 hours asleep in bed this afternoon and boy do I feel good after it. 3. My best bud has returned from the US - safe and sound I hope. Yesterday, I went to my local crop and made 2 los (I was on such a roll that I made another one when I got home) - a bit of a record for me at the moment as I have turned into such a 'paper shuffler' I used to be able to 'crank' pages out without any trouble! 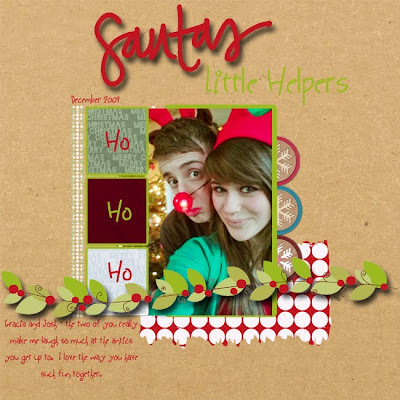 The first page I made was a physical version of 'Santa's Little Helpers' and I have to say that I do love touchy feely los much better than digital ones. I love the process involved in making both digi and hybrid but love being able to have an actual page to put in al album rather than a large photo which is the option with digi. I love those little Paper Chase stickers I have used for the berries. 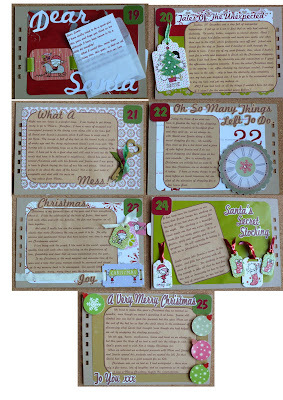 For this page I used Wrap It Up Papers, Christmas Penned Words and Written Down - Aged Labels all from here. 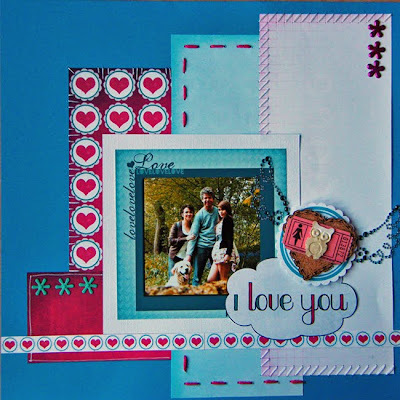 I also used a kit called 'Can't Buy Me Love' and some 'Written Down Sentiments which are going to be released on Tuesday from here for my other two pages. I am so into hybrid at the moment that the only stash I seem to buy is cardstock and digi kits that I can print out. 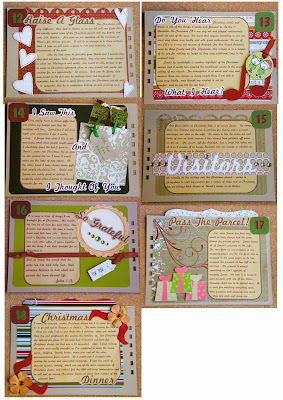 For this page I used one of Shimelle's Christmas templates as a sketch. Don't you just love the turquoise, raspberry and white combination of this kit? 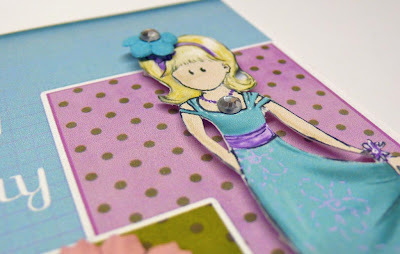 I used a sketch from Creative Scrappers for this page plus lots of hand stitching. 1. We ate lovely, home made, leek and potato soup for lunch. 2. The sun is shining and the snow has gone. Creating something is an inherent part of who I am. I cannot remember a time when I was not making something. My great aunt Grace taught me to knit when I was five and my Nana taught me to sew when I wasn't much older. 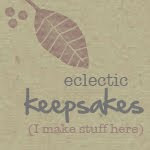 Making stuff is my release and my salvation - I do not have a want to create but it is an obsessive need. I have no choice but to be making things all the time, it is the only way to keep completely happy with myself and my life. My degree, of course, is a creative one and I can find opportunities to be creative in the most unlikely of places. 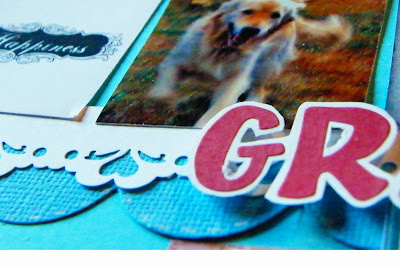 So why do I scrapbook? Because it is my favourite medium for expressing myself, for writing down my frustrations and my triumphs, for celebrating my love of life and my family, for recording the sad, funny, ordinary and just plain weird things that happen in our daily lives. 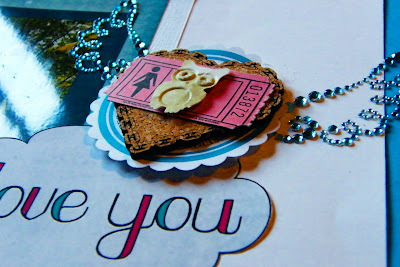 Why do I scrapbook - because scrapbooking is part of who I am and who I want to be. And, yes, I am going to make a mini book. And, yes, I know I haven't finished my JYC one yet (hopefully, that job will be finished tomorrow). 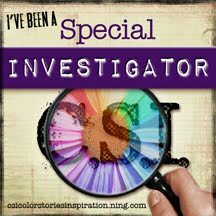 And, yes, I know I have so many mini books I don't know where to keep them all BUT when you read Thursday's post here - how can you be anything but inspired and go and grab your supplies and whip up a cover in readiness for today's prompt? 1. Today is my 'afternoon off' day and I shall get the food shop done, tidy the house and put on some washing - not very exciting you may say but if it is done today then the whole weekend is mine to do as I please! 2. It is good to appreciate why I do things and accept that I have a need and not a want. 3. I am going to our local crop tomorrow and am looking forward to lots of cups of tea, lots of chatting and hopefully (but I wouldn't hold your breath on this one) lots of scrapping. Hey - I'm really sorry that I had to cancel your invitation over to mine last week to see my new bathroom. I have had so much to do and as always not enough time but I will try to rearrange it soon. This very quick post is to show you what I did this evening - Whooo hooo I have made a proper digi page. 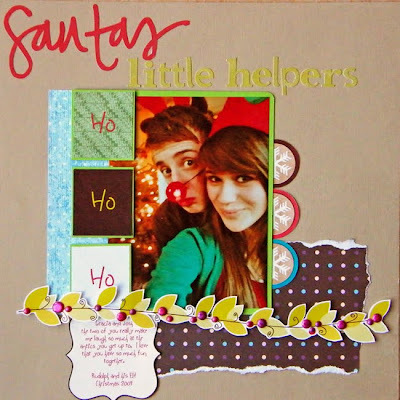 It was all down to this template and this tutorial. Gosh Shimelle is just the business when it comes to explaining how to do things. In no time I was whizzing away doing stuff I didn't know was possible. Although I am so pleased with this page or maybe because I am so pleased with this page I am going to make a 'proper' paper version of it on Saturday - see I am not a fully committed digi scrapper yet! Gracia and her boyfriend get up to such silly antics - like dressing up as an elf and a reindeer! When these type of photos fall into my hands - what am I do - I just have to scrap them! 1. I can do proper digi scrapping. 2. I have had such a fun and happy day at work. 3. In times of upset, David is my rock, my salvation and my voice of reason. It is really cold outside today and it is quite cold inside too. As my pc is in the lounge and as the lounge doesn't have proper walls, has a huge piece missing from the ceiling and doesn't have any central heating, I was struggling to keep it at 5 degrees today and boy is it cold! Never mind I took Kiera for a very brisk walk to warm up and it was very frosty and crunchy underfoot. Yesterday, David and I went for a long walk - well when you go walking with David it is more of a yomp as he really walks at a cracking pace and it is all I can do to keep up. Good for fitness but my legs really ached this morning. 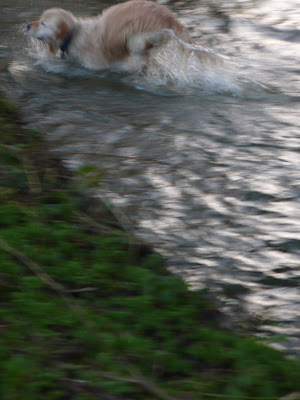 Even though it was literally freezing outside Kiera still went for a swim in the river. I can only assume that either she has no sense of feeling or that the joy of swimming is greater than the pain of being cold and wet. The next batch of finished JYC pages - hooray I am now up to Christmas Day and will try to get a couple more done tonight. I have a crop to go to next Saturday and another one the following Saturday so I am not stressing anymore as I have decided that as long as it is finished by the end of January then I will be delighted. 1. No matter how cold it is in the lounge it is always cosy and warm in the kitchen. 3. I am going to do 30mins on the Wii fit to warm up and hopefully tone up in the process. I am just so far behind with my JYC it is unbelievable. I really am amazed that I cannot find the time to do a page a day BUT I have discovered that it is impossible for me to make a page in 15/30 minutes, even though I am not putting any photographs in my album. I tend to faff about and take ages because everything has to be 'just so'. Maybe one of my aims this year should be to just 'slap it on' and be happy with the result. 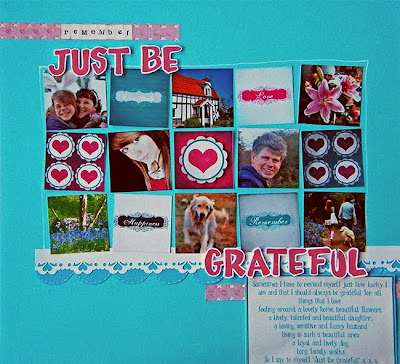 Who else takes 45 minutes to make a page that is 7in x 5in, that has a 5 x 4 journalling block? With so little space to fill I can only assume that it is my indecision's about what to fill the minimal space available with. I am only up to day 20 but will endeavour to catch up as much as possible this weekend. In all honesty my stumbling block was writing about Christmas this year and having to come to terms with it being the first one without Dad. So instead of skipping that page I put it off and put it off. On a happier note, here are the recent ones I haven't posted on the forum and looking on the positive side I am pleased with how they turned out and with my decision not to use photographs. It is more like a diary than a scrap album (I will make one with photographs next year) - I must be feeling good about it if I am contemplating next year's JYC when I haven't finished this year's one yet. 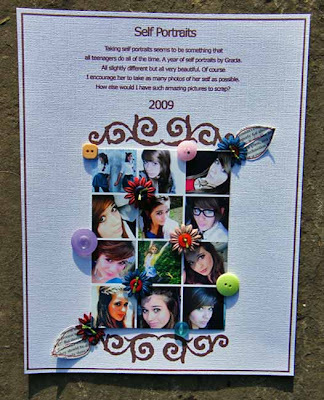 Also I made this page yesterday - it is a hybrid version of the digi one I made on Thursday. I also made another digi page and am getting quite hooked in this style of scrapping - it will never replace paper scrapping but love that speed which results can be achieved - well in my case it still took a couple of hours before the page was to my liking but on the plus side if I had been paper scrapping it would have taken much longer. I must stop paper shuffling so much - all the time. 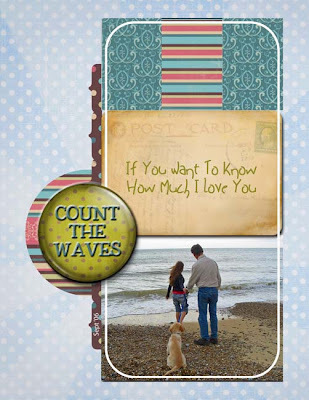 I am thinking of doing Scrapdolly's 52 in 10 project and if I do it digitally then I can complete it and also hone my digi skills! I can't believe I just made that decision on top of all the other stuff I have yet to do - but heyho 'The devil makes work for idle hands'! Have a lovely weekend and drop by next week as I am planning another get together - this time to show off my beautiful bathroom. There may be wine and nibbles on offer! 1. I have made a decision to do something that if it all works out will radical change our lives - for the better I hope. 2. As I look out of my window the sun is shining and making the snow sparkle like a million diamonds - nature is just so beautiful. 3. I AM going to get on and do several pages of my JYC today!